35º and sunny. 4 Mile warm up, then 10 miles @ MP (7:35's) and 1 cool down. The back the church for the evening. AM- 30º, 23º WC... and.... snow. Really. I really hate the heat, but it's very rare for us to still have snow at this point, let alone cold wind chills. Oh well. 5.5 SLOW, my legs were beat. PM- 6+ easy, but at least it felt better. And... SPRING... 61º. Bike path Fisburgh to Kittyhawk to Triangle. 2 Mile W/U and then 5x1 Mile repeats with 1/4 mile active recoveries. Paces were low 7's or 6's depending on headwind vs tailwind- you could feel it. Saw some deer and many people out for a change. Nice Weather does that. 66° with some heavy rain for a good portion of the run. Xenia Station to Beavercreek Station to Eastgate. Windy, but overall enjoyable. Ran some MP miles and would have done more but decieded to be nice and pace some struggling runners. 4 Trail miles, Carriage Hills. So much rain. Made for mud slide and mud suction running. Called it quits after 4. AM- 30º and some flurries. Wind was COLD. 6+ easy. PM- Treadmill (gym) - Just under 7, easy miles with the last one fast-ish. AM- 32°, 22º Wind chill, 14-16 mph wind and heavy flurries. Out early. Weather maybe not ideal, but peaceful easy run all the same (although I admit the wind in the face is distracting). Good morning. PM- TM (gym) 7 more.Last few miles fast-ish again. Good day at work with surprisingly few distractions. AM- Early. 29°, cold wind. The classic. 10 Mile warm up and the intervals. 6x3 Minute intervals with 2 Minute active recoveries. Intervals were all in the 3:20s (6:40's pace). Frost built up on the old cap after those. My legs will be sore later as these always get me. Overall another pretty peaceful run and was out long enough to enjoy some sun rise action. AM- 35º with a brisk wind and heavy snow flurries. Chilly, 6 recovery miles. PM- 51º and sunny, and still windy. Much more plesant evening run. Explored a new section of bike path by Wright Patt AF base. Nice area to get some miles and some rolling hills. 8 easy. AM- 31º, crisp but no wind - very calm. 6 slow. Legs are tired. Afternoon- 51º and sunny. Bike path in Beavercreek. Skunk was out and active along the side. That makes me nervous in the middle of the day, but thankfully he was just far enough off the path to be avoided without incident. Easy run 7+. 52º with some sun. When to Beavercreek station and did 2 mile WU and then 13 at MP or better. 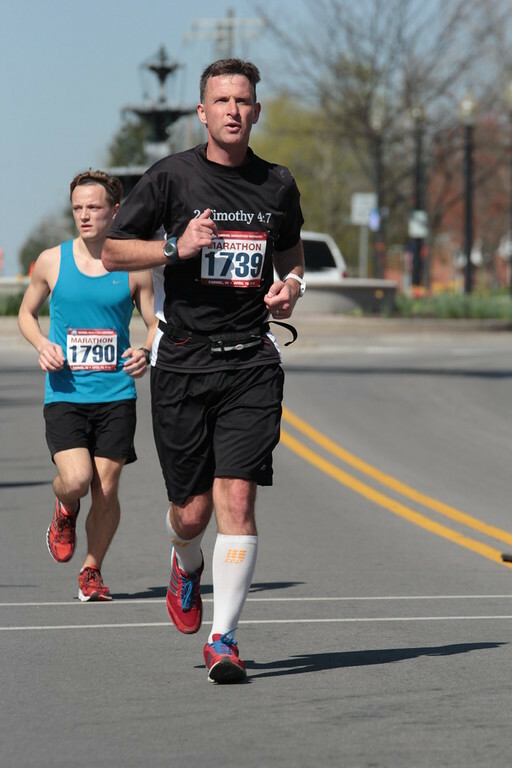 Mile 4 was 6:54. Not sure why or how as there was no wind or hills, I just got lost in the run and it felt good. Rest were 7:28-7:40. 5 Mile cool down. AM- 51º 6 recovery - liking the temps up from last week. PM- 52º and steady rain. Charleston Falls trails. Plenty of hills.6 slow. AM-51º with a mist and some wind. 5:30. 7 easy. Did see but nimbly avoid the young skunk this morning. Thats 2 in 5 days. PM- 7 more miles. Then core and adductor workouts. I needed that after a very hectic day at work. Its been quite busy around the house with my daughter in theater and the show last & this weekend and at work we are starting another business and opening next week. Running keeps me grounded. AM- 5am start. 52º with some wind. 6 mile warm up to the 'track'. 12x400's w/60s active recoveries. A little slow, but my effort was good, at least for the most part. I dogged #10, but then pushed my legs for to at least give effort until the end. 90-112 . Interesting thing is I have been seeing skunks out lately so this was totally a different direction and yet another skunk was in the middle of the field. Happy I wore the headlamp so he did not sneak attack me.